file. So it seems to me that this is some sort of bug? Alan Harder added a comment - 2009-11-16 09:42 These are served by Hudson.doNocacheImages().. I don't see any problems in these images, so I'm closing this old issue. If you do still see a problem with a recent Hudson release, please reopen and check the hudson/tomcat log for any exceptions, thanks. I have this problem with Hudson 1.351 and I can provide a stacktrace. The problem is not new though, I have had it for months now. I dont have an 404, but an 500 error but I end up having the same situation as shown in the screenshot attached. tine2k added a comment - 2010-03-19 06:22 stacktrace added. tine2k, what browser are you using? Do you see this problem with another browser type? Alan Harder added a comment - 2010-03-19 07:21 tine2k, what browser are you using? Do you see this problem with another browser type? Server env details? I've tried with the following browser: Firefox 3.6, IE 8 and Chrome 4. All have the same result/exception. The server I use is Apache Tomcat 6.0.20 with JDK 1.6.0_14-b08 under Solarix x86. tine2k added a comment - 2010-03-22 06:10 I've tried with the following browser: Firefox 3.6, IE 8 and Chrome 4. All have the same result/exception. The server I use is Apache Tomcat 6.0.20 with JDK 1.6.0_14-b08 under Solarix x86. I have the exact same problem under Weblogic 10 and JDK1.5.0_18. Vincent Latombe added a comment - 2010-03-31 21:22 I have the exact same problem under Weblogic 10 and JDK1.5.0_18. can either/both of you enter this in Manage Hudson / Script Console and report the results? 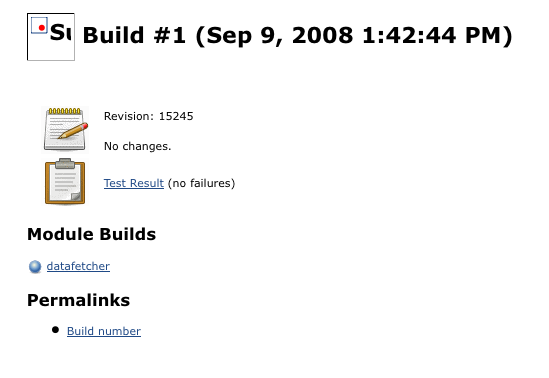 I'm tempted to just remove the nocacheImages thing, as it exists just to workaround a firefox bug that has been fixed since Dec, 2008 (firefox 3.0.5 and newer are fixed). Alan Harder added a comment - 2010-04-03 08:05 I'm tempted to just remove the nocacheImages thing, as it exists just to workaround a firefox bug that has been fixed since Dec, 2008 (firefox 3.0.5 and newer are fixed). fixed since 3.0.5 (Dec, 2008). SCM/JIRA link daemon added a comment - 2010-04-07 14:24 Code changed in hudson User: : mindless Path: trunk/hudson/main/core/src/main/java/hudson/model/Hudson.java trunk/hudson/main/core/src/main/java/hudson/model/Job.java trunk/hudson/main/core/src/main/java/hudson/model/Run.java trunk/www/changelog.html http://jenkins-ci.org/commit/29855 Log: [FIXED JENKINS-2341] Colored ball image at top of build pages was broken for Hudson in some web containers. Fixed by removing workaround (r323) for a Firefox bug ( https://bugzilla.mozilla.org/show_bug.cgi?id=89419 ), fixed since 3.0.5 (Dec, 2008). SCM/JIRA link daemon added a comment - 2010-04-07 14:26 Code changed in hudson User: : mindless Path: trunk/hudson/main/core/src/main/java/hudson/model/Hudson.java trunk/hudson/main/core/src/main/java/hudson/model/Job.java trunk/hudson/main/core/src/main/java/hudson/model/Run.java trunk/www/changelog.html http://jenkins-ci.org/commit/29855 Log: [FIXED JENKINS-2341] Colored ball image at top of build pages was broken for Hudson in some web containers. Fixed by removing workaround (r323) for a Firefox bug ( https://bugzilla.mozilla.org/show_bug.cgi?id=89419 ), fixed since 3.0.5 (Dec, 2008). @mindless, thank a lot for fixing this. The problem only happens in my production environment, so I can not test there. @vlatombe: Can you test if the fix works? tine2k added a comment - 2010-04-07 23:29 @mindless, thank a lot for fixing this. The problem only happens in my production environment, so I can not test there. @vlatombe: Can you test if the fix works?